Definition at line 48 of file llhudeffect.h. Definition at line 45 of file llhudeffect.cpp. References FALSE, LLHUDObject::mDead, mNeedsSendToSim, and mOriginatedHere. Definition at line 56 of file llhudeffect.cpp. Definition at line 88 of file llhudeffect.cpp. Definition at line 125 of file llhudeffect.cpp. References _PREHASH_Effect, _PREHASH_ID, _PREHASH_Type, LLMessageSystem::getU8Fast(), and LLMessageSystem::getUUIDFast(). Definition at line 108 of file llhudeffect.cpp. Definition at line 119 of file llhudeffect.cpp. Definition at line 131 of file llhudeffect.cpp. Reimplemented in LLHUDEffectBeam, LLHUDEffectLookAt, LLHUDEffectPointAt, LLHUDEffectSpiral, and LLVoiceVisualizer. Definition at line 61 of file llhudeffect.cpp. References _PREHASH_AgentID, _PREHASH_Color, _PREHASH_Duration, _PREHASH_ID, _PREHASH_Type, LLMessageSystem::addBinaryData(), LLMessageSystem::addF32Fast(), LLMessageSystem::addU8Fast(), LLMessageSystem::addUUIDFast(), gAgent, LLAgent::getID(), mColor, mDuration, mID, LLHUDObject::mType, and LLColor4U::mV. Referenced by LLVoiceVisualizer::packData(), LLHUDEffectSpiral::packData(), LLHUDEffectPointAt::packData(), LLHUDEffectLookAt::packData(), and LLHUDEffectBeam::packData(). Definition at line 78 of file llhudeffect.cpp. Definition at line 93 of file llhudeffect.cpp. Referenced by add_object(), app_request_quit(), LLToolDragAndDrop::commitGiveInventoryCategory(), LLToolDragAndDrop::commitGiveInventoryItem(), LLSelectMgr::confirmDelete(), LLToolDragAndDrop::dad3dTextureObject(), derez_objects(), LLToolDragAndDrop::dropInventory(), LLToolDragAndDrop::dropObject(), LLToolDragAndDrop::dropScript(), LLToolPie::pickAndShowMenu(), process_teleport_finish(), and LLSelectMgr::selectionSetImage(). Definition at line 98 of file llhudeffect.cpp. Referenced by add_object(), LLToolDragAndDrop::commitGiveInventoryCategory(), LLToolDragAndDrop::commitGiveInventoryItem(), LLSelectMgr::confirmDelete(), LLToolDragAndDrop::dad3dTextureObject(), LLToolDragAndDrop::dropInventory(), LLToolDragAndDrop::dropObject(), LLToolDragAndDrop::dropScript(), LLToolPie::pickAndShowMenu(), LLSelectMgr::selectionSetImage(), LLHUDEffectLookAt::setLookAt(), and LLHUDEffectPointAt::setPointAt(). Definition at line 83 of file llhudeffect.cpp. Definition at line 103 of file llhudeffect.cpp. Referenced by LLHUDManager::createViewerEffect(), LLHUDEffectLookAt::setLookAt(), LLHUDEffectPointAt::setPointAt(), and LLHUDEffectLookAt::update(). Definition at line 114 of file llhudeffect.cpp. Definition at line 70 of file llhudeffect.cpp. References _PREHASH_Color, _PREHASH_Duration, _PREHASH_Effect, _PREHASH_ID, _PREHASH_Type, LLMessageSystem::getBinaryDataFast(), LLMessageSystem::getF32Fast(), LLMessageSystem::getU8Fast(), LLMessageSystem::getUUIDFast(), mColor, mDuration, mID, LLHUDObject::mType, and LLColor4U::mV. 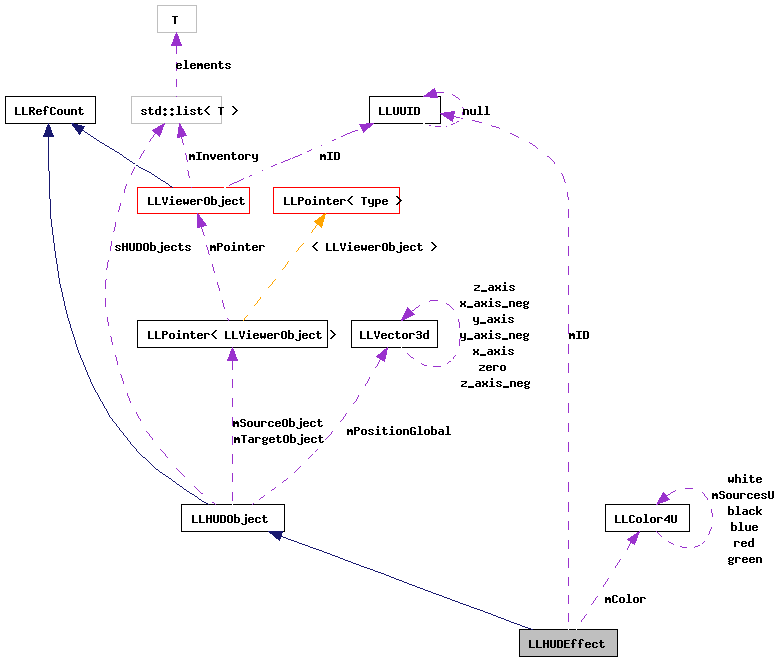 Referenced by LLHUDManager::processViewerEffect(), LLHUDEffectSpiral::unpackData(), LLHUDEffectPointAt::unpackData(), LLHUDEffectLookAt::unpackData(), and LLHUDEffectBeam::unpackData(). Reimplemented in LLHUDEffectLookAt, and LLHUDEffectPointAt. Definition at line 136 of file llhudeffect.cpp. Definition at line 63 of file llhudeffect.h. Definition at line 79 of file llhudeffect.h. Referenced by packData(), LLHUDEffectBeam::render(), setColor(), LLHUDEffectSpiral::triggerLocal(), and unpackData(). Definition at line 78 of file llhudeffect.h. Referenced by LLHUDEffectBeam::LLHUDEffectBeam(), packData(), setDuration(), LLHUDEffectLookAt::setLookAt(), LLHUDEffectPointAt::setPointAt(), LLHUDEffectSpiral::triggerLocal(), LLHUDEffectBeam::unpackData(), and unpackData(). Definition at line 77 of file llhudeffect.h. Referenced by getID(), packData(), setID(), and unpackData(). Definition at line 81 of file llhudeffect.h. Referenced by getNeedsSendToSim(), LLHUDEffect(), and setNeedsSendToSim(). Definition at line 82 of file llhudeffect.h. Referenced by getOriginatedHere(), LLHUDEffect(), and setOriginatedHere().